E.W. Scripps TV KJRH 2 Works for You and iHeartMedia are joining forces. The two media leaders in Green Country will now be partners, delivering weather and news across all radio stations and 2 Works For You. “This was exactly what we have been searching for at 2 Works For You – a strong radio leader in this market that has the same values and vision that we have at 2 Works For You, says Vice President and General Manager Amy Calvert. 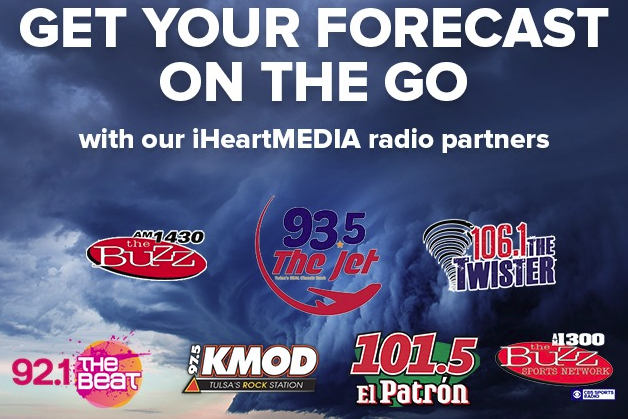 “iHeartMedia is the best in the business and it only made sense that we team up to keep Green Country safe in all-weather situations and up to date on all breaking news." Starting Monday, August 6, listeners of iHeartRadio stations KMOD 97.5, KTGX (106-1 The Twister), KTBT (92-1 The Beat), KIZS (101.5 El Patron), KTGX-HD2 (93-5 The Jet), KTBZ-AM (1430 The Buzz) and KAKC-AM (1300 The Buzz) can hear up-to-the-minute weather forecasts from 2 Works For You Chief Meteorologist Mike Collier and the 2 Works For You Weather Team. When severe weather strikes, you can get the most accurate weather forecast on TV, radio or on your smart phone via the Channel 2 app or the iHeartRadio app. You can expect to see community partnerships and strong involvement from both 2 Works for You and iHeartMedia in Green Country.